RBTH has compiled a listing of the top food festivals and farmers’ markets to be found in Russia this summer. Where: Novosyolki village, Ryazan Region. The Raspberry Festival in Novosyolki has been running for five years. At the Raspberry Market you can get fresh berries, dried raspberry leaves, curative jams, sweet syrups, and the famous Raspberry Liqueur (20º proof, and made from pure raspberries). Visitors are treated to free tea, made to an old local recipe, along with pastries filled with raspberry jam. Every year visitors are invited to participate in making the largest raspberry tart in Russia – more than a metre across. Ryazan Region is renowned for raspberries, and the bushes here can reach more than 2–3 metres in height. Best to take a train to Ryazan from Moscow’s Kazansky Station, or an intercity bus. Journey time is 3.5 hours. Then from Ryazan take Bus 114 from the “Myasokombinat” bus-stop. Buses leave every 40 minutes. At the XIII International Cucumber Festival in Suzdal you can sample cucumber jam, cucumber soups – definitely including the traditional cold Okroshka soup – cucumber pastries, and other dishes whose recipes haven’t changed for 500 years. At the Cucumber Fair there are cucumber seedlings for sale; and you can buy fresh, marinated or salted cucumbers, Russia’s favourite vodka snack. Local chefs are offering master classes which reveal the secrets of traditional recipes, while visitors who happen to have been born on this auspicious day will enjoy a special ‘cucumber birthday’. For many years visitors have been coming to this festival in Suzdal from locations as diverse as Bulgaria, Serbia, France and Mexico. Suzdal is a town on the well-established "Golden Ring tourist route – the best way of visiting the festival would be take the whole route, either by bus or bicycle. 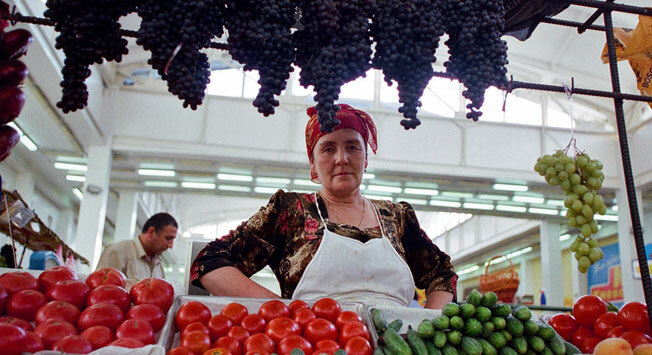 The Syzran Tomato Fair has been the calling-card of Samara Region since 2001. The town’s streets are renamed in honour of tomatoes, with a ‘tomato parade’ in the morning. In the evening there’s a tomato battle – Syzran’s answer to the Spanish Tomatina. Throughout the entire Fair guests are allowed to try all of the foodstuffs at the market for free. They can also buy seeds, fresh and bottled tomatoes, birch-bark souvenirs and local craft items. Fifteen trains per day depart from Moscow, leaving from Kazansky Station, with a journey time of 12 hours. However, better still would be include Syzran within a Volga River cruise by taking a bus from Samara (175 kilometres). The slightly flattened-bulbed Lukh onion is known throughout Central Russia. Ivan the Terrible was a great enthusiast for onions from Lukh, and in the C16th the flattened white bulbs were delivered straight to the royal table. These days there is an Onion Fair held in the village of Lukh (whose name is a variant spelling of ‘onion’). Visitors can see an exhibition with onion bulbs on sale, try a variety of onion pies at a tasting, see the largest onion in Russia, vote for an “Onion Queen”, and take part in master classes run by chefs and gardeners. If you are travelling around the “Golden Ring” route then take the chance to see its ‘pearl’ – Ivanovo, the city of brides. Express buses depart from Ivanovo to Luk at 10:25 and 12:00 Mon-Sat (no service on Sundays). Astrakhan has been cultivating watermelons since the C7th. They became popular in Russia thanks to Tsar Peter the Great, who once tried them in an Astrakhan bazaar. Back then watermelons weren’t eaten raw – the slices were dunked in a marinade, and then cooked with peppers and hot spices. For the past 10 years the Astrakhan Region has been producing around 110 thousand tons of watermelons annually. The Russian Watermelon Fair takes place in Astrakhan every year, coinciding with City Day, on the third Sunday in September. There are seeds and seedlings on sale, and you can try exotic kinds of watermelons – like Moon Watermelon, which has pale yellow flesh. You can measure the diameter of the largest watermelons, weigh the heaviest, take part in the “fastest eater” contest, and carry off as many free watermelons as you can lift. Astrakhan is one of the major ports-of-call on Volga river cruises . Air tickets from Moscow to Astrakhan go from 300 euros return, and are available from official outlets of S7, Utair and Aeroflot airlines. The Potato Festival takes place on the first Sunday in October in the village of Vodovatovo. Farmers from across southern Russia sell potatoes at cut prices, chefs take part in potato-recipe contests, and locals give master-classes on growing potatoes. Every year the Arzamassky District of Nizhny Novgorod Region produces around 200,000 tons of spuds – if you loaded them all in rail boxcars, the train would be forty kilometres long. It’s best to take in Vodovatovo as part of a trip to ‘Russia’s Detroit’, Nizhny Novgorod – or alternatively, as part of a Volga River cruise. Harvest Festivals can be found in almost every region of Russia in September and October – but the most colourful of them all is the Urun Toiy festival held in the Siberian Republic of Khakhassia. All kinds of vegetables, fruit, berries, herbs and seeds are on sale at the festival – but you might also see the legendary folklore wedding ceremonies, which traditionally take place on these days, as well as national wrestling, horse-racing and trials of strength. You can see people dressed in traditional Khakhassian national dress, you can take part in all kinds of skylarks, or learn the art of throat-singing. You can fly to Abakan from Moscow on either S7 or Aeroflot, with return tickets running from 300 euros, and available at official airline outlets. An optimal visit would include the Harvest Festival in a tour of Khakhassia’s national parks.